The Samurai genre and the Western are so closely tied by themes and storylines that it's amazing the great Japanese films of the Sixties and Seventies haven't made a larger impact in the United States. I've been a casual fan of the Samurai genre since my first viewing of Shogun Assasin in the mid-Eighties. That led me to the Lone Wolf and Cub series and eventually the Zatoichi Blind Swordsman series. These films work well in a series because of the epic storytelling - the growth of the legend of the samurai hero becomes the overall importance. He must face continuing challenges like a superhero, overcoming them and staying free of the rule of society. The Criterion Collection has always picked important films from this genre - including most of the key works of Kurosawa. 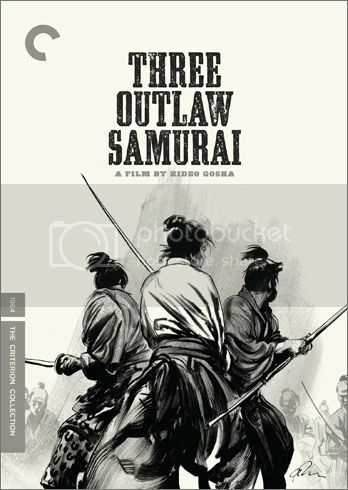 I was excited to see the recent release of the 1964 Samurai genre classic, Three Outlaw Samurai on Blu-ray. I've been familiar with the director Hideo Gosha by name only. I knew of the importance of this film and his 1965 film Sword Of The Beast as outstanding works. But I had yet to see any of his work in any genre. Three Outlaw Samurai comes as an interesting offshoot of a TV series by the same name. The film uses characters from the show and tells essentially an "origin story". In theory, viewers would already be more familiar with the adventures of the characters than a current viewer coming to it for the first time. The story of the Three Outlaw Samurai is relatively simple - but that just mirrors the "black and white", "good vs. evil" set-up of both the Samurai and the Western genres. But like most of the great works within the genres, the characters are never as simple as they seem at first. Remember, this is a full ten years after Seven Samurai and three years after Yojimbo. It is the same year as A Fistful of Dollars. All of these are standouts that have simply portrayed lead characters who operate on many changing moral levels. The set-up of this film is that a group of villagers have kidnapped the daughter of the magistrate in order to negotiate with him. The villagers have claimed they won't kill the daughter, although it seems they might, and the magistrate tells them he won't kill them if they return his daughter, although it seems clear that he might. Once this basic web has been constructed, Gosha, introduces the viewer to the three outlaws. Each section is constructed almost like an episode of the TV show to let the viewer gain knowledge of each samurai. The first (Tetsuro Tamba) is out of the "Toshiro Mifune as Yojimbo" school. He wanders the countryside looking for an opportunity to make money by using his sword. After coming upon the kidnapped daughter, instead of rescuing the daughter, he sees that there would be more money in helping them to kill the magistrate. The second samurai (Mikijiro Hira) works for the magistrate and is willing to kill the peasants because of his loyalty to the magistrate. The third samurai (Isamu Nagato) is a slightly overweight prisoner who agrees to help the magistrate if he is let free. The rest of the film is a brilliantly shot period piece with beautiful cinematography and lots of fighting. Having three main characters creates a wealth of possibilities and all are explored. Each man will change allegiances through the film at least once and sometimes more and there is constantly the feeling of two against one until all three decide to band together. The final scenes are on par with the best the genre has to offer. I'm reminded of some of the best battles in Yojimbo mixed with fun of the Zatoichi series. This really makes me want to see Sword Of The Beast. This is not simply a TV show converted to the big screen. There are cinematic techniques that are beyond what one would expect from a TV show. The action spreads from side to side on the widescreen. A stabbed warrior will stumble across our field of vision in a tight shot and all three will fill the left and right of the screen in the longer shots. This would never translate to a square TV screen. The finale is satisfying and does not have the feeling that you're missing information by not having watched the TV show. The Criterion release is short on extras and that's probably why it's priced a bit cheaper than similar genre efforts. There is a small booklet and the trailer. The transfer is up to the usual Criterion quality and the B&W cinematography looks really sharp. I'd like to see Criterion do even more from this genre and produce a documentary extra with a great overview of the genre. I feel like I'm missing some really important works. With a very simple plot, Hideo Gosha shows that seemingly simple characters can create a vivid and imaginitive film. I think this will spur you on to check out more in the genre and revisit some of the classics.